After Sunday’s brunch of quiche and salad, my youngest daughter slipped away from our table’s conversation. She and her father have never abided by the customary, “Excuse me, please.” No method of appeal on my part has reversed this paternal trait. I glanced to my husband and son-in-law. “Excuse me,” I said, and followed my third-born into the living room. As I thought. There sat my photo thief on the floor before the low credenza at the end of the sofa. She shuffled through snapshots like a card shark. Then she opened another drawer. I’ve appreciated photography from the day my Uncle Tab and Aunt Alma Leigh gifted me my first camera for high school graduation. I treasure the moments I’ve captured of my abundant life as I do my father’s home movies and the old black and whites I’ve inherited from my mother and in-laws—an endless source of stories in my beloveds’ absence. “Don’t take any,” I said. Of course. She’d asked me for pictures of her late sister a while ago. I’ve attempted to gather some, but I cannot let them go. My youngest will have to wait until I kick the bucket. She held up her cell phone and snapped pictures of pictures. 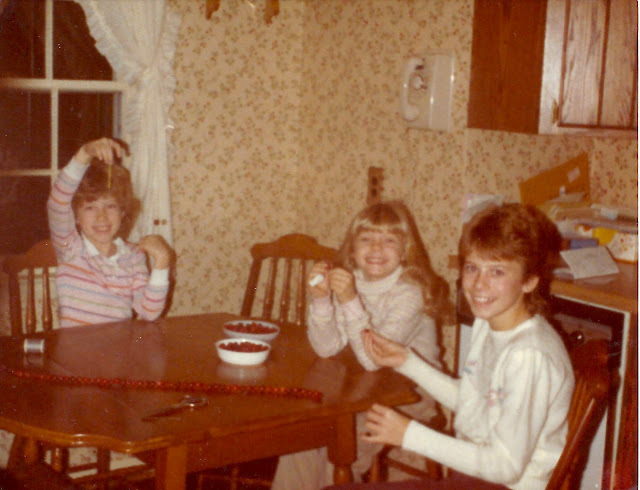 One was of my three girls, all smiles, stringing cranberries for the Christmas tree. It is God’s amazing grace that kept me on my feet in that gust of empathy for my living children and the flood of grief for my lost. It’s not a matter of immaturity, but self-preservation that I hold onto what I have left of my firstborn. After I hugged our daughter and son-in-law good-bye, I returned the pictures to the drawer. I recalled the winter at the onset of my empty nest when I sorted my prints. The chronological order of our family history covered every square inch of the dining room table. Then I filled the empty albums my father-in-law had gifted us for Christmases throughout the years. Milton Underwood kept remarkable care of what mattered to him, and I aimed to follow his example. Then Becky left before I finished the project. I stored the remaining photos in the credenza where many others have since gathered. This week I attended the Organizing Your Family Photos workshop hosted by the Addison Township Library. Women carried in bins and boxes. We shared the same frustration of getting started with this tedious quest. The empty albums I inherited from my father-in-law last spring answered one need. Dear Reader, my youngest may not practice the best table manners, but I’m confident she’ll cherish the evidence of her abundant life after I’ve left for Glory. Then her older sister will deal with the family’s photo thief.